These are scary questions to hear from a client – and they are easy ones to push back on – often with some variant on the common reasons reputable SEO firms don’t promise guaranteed search rankings. Especially early in our careers as consultants, it is incredibly easy to fall into the trap of pushing back on the specific thing the client asked for (because we’ve learned that we need to be a trusted advisor rather than just a paid lackey who’ll say yes to any request). Well, I’m here today to tell you that’s a mistake. Very rarely is a client looking for a contractual guarantee of future performance (if they are, the only way this can work is on a pay-for-performance model which would have to be the topic of its own post. But suffice it to say that there’s no such thing as a successful cheap pay-for-performance contract – any that work are going to be very expensive so plan accordingly). And we shouldn’t fall back on the Google position that reputable firms don’t offer ranking guarantees. That’s not what smart clients are looking for. In both these cases, I’d argue that the true need is more like a range of likely scenarios than it is a single forecast. Everyone understands that things might not work perfectly as planned or precisely as in the best case scenario – but by presenting some scenarios, they get a feel for the range of outcomes and a sense of the risk associated with them. But I’m getting ahead of myself. Let’s step back to some definitions. A model in this context is similar to the concept of a “scale model” – in other words, a smaller, simplified version of the real thing that shows how it works. Typically built in spreadsheets in a business context, this is a mechanism for turning inputs and assumptions into outputs or outcomes – it essentially encapsulates an opinion on “what the levers do”. In the context of digital marketing, it might be a spreadsheet that captures how much more traffic we might get over time if we change the pace of publishing different kinds of content on our site. A scenario is a model along with a specific set of inputs and assumptions – not necessarily the set of assumptions that the author believes to be the most likely – it’s more a case of “what happens if the world looks like this and we do that?”. Scenarios are most useful and interesting when we produce a range of them in order to discuss the likelihood and attractiveness of different outputs. In the context of digital marketing, this might include assumptions around how average tests change conversion rates and what proportion might turn out to be successful along with inputs about how many experiments we might be able to run per quarter. A forecast is essentially an opinionated scenario – it’s the outcome you think is likely if you follow a certain path and try to execute a certain plan. It is possible to have a group of forecasts – either under varying plans (inputs) or with different assumptions (essentially a group of forecast scenarios – e.g. conservative / aggressive). For the most part, when people ask for “a” forecast, the best answer is a range of scenarios that show possible outcomes and the sensitivity to assumptions and inputs. It’s much easier to put these scenarios together if you first focus on the much lower-pressure task of building a model without the stress of having to calibrate the right assumptions and perfect plan. A range of scenarios helps in most requests for a forecast – it’s useful for getting sign-off as you can focus on how much of the range of outcomes has sufficient return to justify the investment. 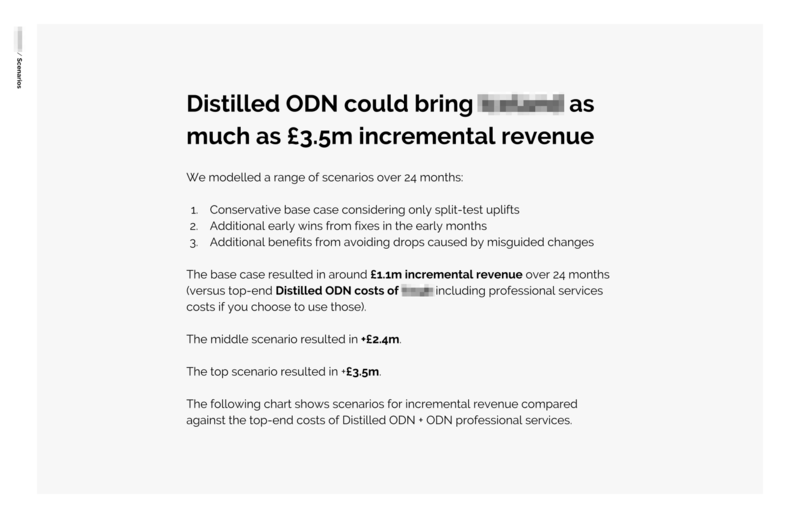 It’s also good for attempting to constrain the limited number of cases where the activity turns out not to have been worthwhile – and even allows you to change the plan to reduce the impact of those failure cases if needed. Earlier in the process, it’s good for figuring out if something is a vaguely sensible plan before getting too committed to it – does the top end of the range of possible outcomes have a big enough impact to be worthwhile? If you can’t even model a result that’s worth it, you need to act immediately to revise the plan because it’s clearly not going to be something you’re going to want to pitch. What do you do with the output? Note: Sometimes you will share the actual model – but generally only as a deeeeeep appendix. 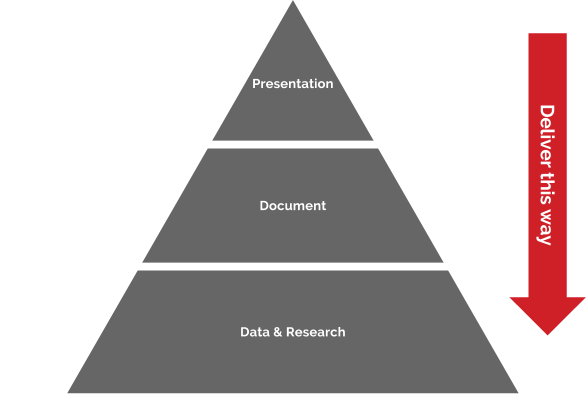 The model is how you create the scenario(s) which becomes the data at the bottom of the pyramid. Even the exact scenarios might only be an appendix – instead, you need to remember to tell the story that you discover this way. How do you build a great model? The first thing to note is that the pressure feels much lower as soon as you acknowledge that you are just building scenarios at first. The first scenarios don’t have to be close to realistic – you are just trying to capture the mechanics of how things change when you move input assumptions around. This stage is just about getting the levers in place. You can set sensible assumptions later. Top-down model: is one which starts with the market as a whole and estimates market share, forecasts trends over time in % terms etc. Bottom-up model: is one which starts with the product or service itself, looks at units, at production capacity, at route to market etc. Think about key inputs and what direction they move your key outputs. What’s the relationship? Does doubling the input double the output? More? Less? As you start to see the model take shape, spend some time playing with the inputs and watching the outputs. Don’t worry about overt realism yet, but instead focus on the dynamics – does everything move in the direction you expect? Does it move in the ratios or proportions you expect? Explore the space of possible inputs a bit. Now you’re ready to run some scenarios. Remember that a scenario is what I’m calling “a model along with a specific set of inputs and assumptions”. 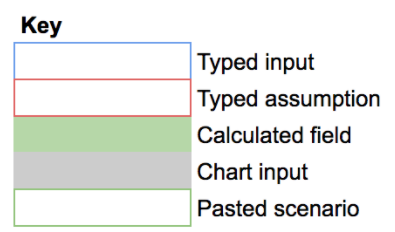 So you’ve set your assumptions above – meaning that the way you generate scenarios is by tweaking your inputs. I like to start by just playing about with unrealistic ranges of each input – typically I find at least one bug in my model this way when it completely fails to react to an input or does something unexpected. More interestingly, even when you’ve built a highly-complex and detailed model, you will often find that its outputs are only truly sensitive to one or two key inputs and that the output changes very little as you play around with the others. You’ll notice that I haven’t really dug into the actual mechanics of getting models from idea to implementation. For most people, this will involve spreadsheets, and the great thing about spreadsheets is that you can use them with almost any level of computer skill – from typing each cell into a table all the way up to complex linked models. For an excellent primer, I still recommend an article that a colleague of mine at the time (Mike Pantoliano) wrote back in 2012 or so: Excel for SEO. I wanted to share something real, but everything I’ve built recently has been too niche or too confidential, so I put together a completely made-up dummy one. When you take a look at it, you’ll realise that it’s obviously not designed to be useful – but rather to illustrate some of the points I have been making above. I have annotated it with notes to show where I have demonstrated key elements. Although it’s not large or sophisticated, I have done my best to show most of the key features you’d need to build something much more involved. I’d love to hear your own experiences building models. What tips and tricks do you use all the time? How do you prepare forecasts and scenarios that stand up to client/boss scrutiny?